Season chorizo with the salt, cumin, and chili powder. Heat ½ tablespoon oil in a large skillet over medium heat and cook the chorizo until done, about 5 minutes until cooked through and no longer pink. Breaking it into pieces as you fry it. Set it aside on a plate to cool. Place the onion in the same skillet you used to cook the chorizo and cook, while stirring, for 4 to 5 minutes, until caramelized and very golden brown. Remove the onion from the skillet and set aside. Preheat the rest of the coconut oil in a deep cast iron skillet to 350°F. To assemble, lay a slice of prosciutto on a plate. Sprinkle 1 tablespoon of the shredded cheese down the middle, followed by 1 tablespoon of cooked chorizo, then top the chorizo with 1 tablespoon of the caramelized onions. Roll it up tightly and place it seam side down. Repeat with the rest of the “tortillas”. Test the oil temperature to make sure it is hot enough by placing the tip of a chimichanga in the oil, if it sizzles, it is ready, if it doesn’t heat for another minute to re-test. Place chimichangas in the skillet 3 at a time. Cook for 1-2 minutes on each side, until golden brown. Remove from skillet with a slotted spoon. Set on paper towel to drain. 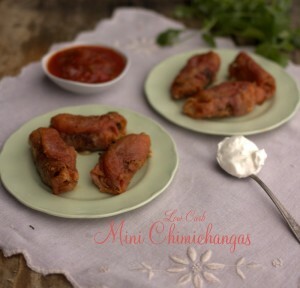 Place on serving platter and serve with enchilada sauce, a dollop of sour cream, salsa and cilantro.